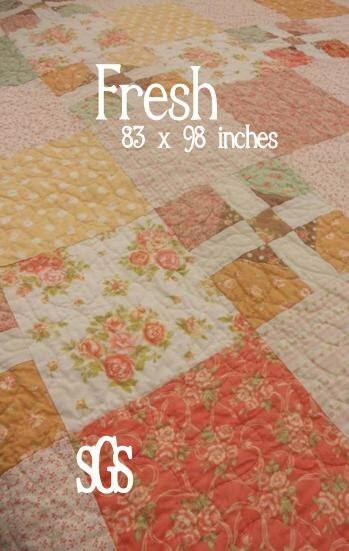 Fresh pattern is 83 x 98 inches. It has clear directions printed in black and white along with a color front printed on cardstock paper. Pattern is held together with a metal brad paper fastener instead of a plastic bag. Pattern uses a mixture of Fig Tree's Breakfast at Tiffany's, Fresh Cottons, and Millhouse Inn and 3 Sister's Astor Manor for a shabby cottage feel.